I have a habit of using existing characters for new media, but I redefine them with every incarnation. Icraye Uolonia (Pictured) is a good example of this. 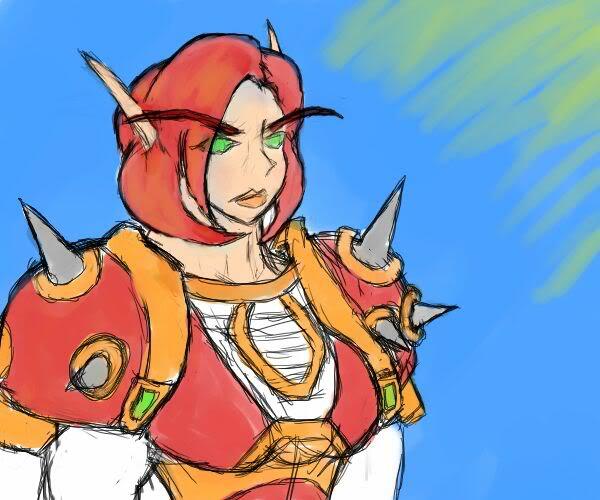 This is her Blood Elf (World of Warcraft) self. Sometimes I feel like the hardest part about being a writer is drawing people in the general direction of your work. It’s one thing to write badly, or to write well even, but it’s another thing entirely to be marketable. It’s been almost a year since the blog has been up, however I didn’t really understand what to do with it until April of this year. A year ago this was a procedure to me, a seed to plant on my wide eyed and naïve first steps into the writing world. I’ve actually been writing for a good chunk of my life. At some point I considered myself more of an artist than a writer, but I found much of my work fell unfinished and I ended up settling for something I only half loved. Looking back I can think of a few key aspects in my urge to create. When I was in middle school I made scribbles on the margins of my homework or filled pages with sketches of super-heroes. Before creativity really set in, the concept of a good name didn’t really seem that important. Back then we used to just add man to our names and call it a day. I was no exception, but when I realized in my young brain that needed adjusted. So I came up with Macro Man. I felt so witty when I made this up especially since it was before the computer term was coined. A MMO player would likely raise a brow at it these days considering ‘Macro’ carries more meaning as a chain of commands rather than the opposite of Micro. I had initially planned on it being a comic book, and I actually have a fair amount of this penned in the form of simply drawn panel comics. It turned into a rather large cast and a pretty coherent story. The problem with Mac was he was a rather blatant author avatar and wish fulfillment. He lacked substance and I ended up covering it up with lackluster story-telling and an implausible power set. If I ever actually did anything with him I would have to redesign from the ground up. This is a writing endeavor I started in middle school as well. Unlike the Macro Corp, this one feels salvageable to this day. Raymond was a very flawed character, other than his knack for being a pretty good shot he was a bumbler. I ended every ‘case’ with him getting hurt in some way and there were some good ideas to be had. 6′ 2″ of pure cheese. This is a good example of a good idea gone terribly wrong. Krauner is a screen name I use to this day. He is the personification of my competitive spirit. Unfortunately he would also get my pants sued off by Capcom if I actually used him in his past form. I could probably pass him off as an affectionate parody, but he was a shape-shifter that primarily used moves from Fighting Games. Looking back on him, he wasn’t a completely terrible character but if the parody thing was going to be used it would have to be toned down considerably. The fact that he ran a fighting arena is probably salvageable too. I’ve always wanted to write a near future fighting arena that acted like over the top WWE matches but with people doing improbable fighting techniques. I should probably drop the ‘Z’ from Battle Zone too. It was never meant as a Dragonball Z reference but I think everyone assumed it to be. I could tell from the amount of Goku clones people tried to write into it on the BBoard where it was originally posted. Nell Draadich, one of my best developed female characters. This is likely my largest and most ambitious writing venture to date (Besides my Dimanagul of course). Ki-Rainelle is a BBoard continuous story I co-wrote with the love of my life and other talented writers. You’ve probably heard me talk about her before, but she is the Artist / Author for the Web Comic Fate Martyr Sapheire. Ki-Rainelle is actually a prequel setting for the tale set generations before the main characters of FMS. I cannot stress how much fun I had writing Ki-Rainelle. It was there I had the opportunity to make oceans of characters and devise large scale conflicts I never thought myself capable of. My Photo Bucket Folder serves as a reminder of many of these characters. You might notice there are more avatars for specific characters than others, among then Jaelion Eliraine, Celestia Tershwind, and Xallion Arainare. 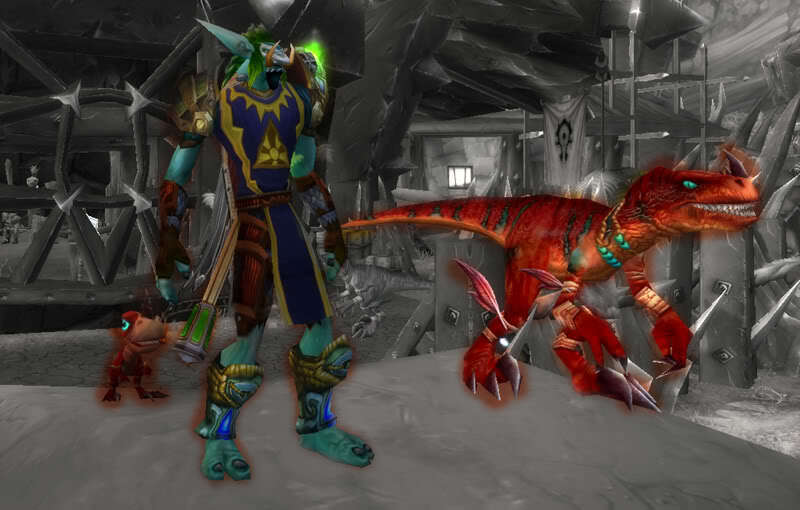 Jumbalaya, my hunter, was my first character in World of Warcraft. The Red Raptor next to him, Gumbo, was the first pet I ever trained on him. While it is a MMO there is a great deal of storytelling potential. I didn’t take it that seriously when I started out but each of my characters has a tale to tell in World of Warcraft. Some of them, like Icraye above, are incarnations of past characters over the years. Also among them; Tershwind, my Warlock is a proxy of Celestia from Ki-Rainelle. ; Marguldia, my priest, is a considerably toned down version of Marguldia Marindell in Ki-Rainelle; Xallion, My Warrior, a orcish proxy of Xallion Areinare ; Nehl, My Mage, an orcish proxy of Nell Draadich; and of course Icraye, my paladin, Icraye Uolonia also from Ki-Rainelle. Whew! That’s quite an ensemble you have there. Suffice to say you’ve put some thought into these guys. Your talk about Macro Man interests me, to be honest. And not just the character (rebooted or original), but the lessons learned from him. In my own experience, I’ve dreamed up a fair share of characters dating back to my own middle/high school days. Outside of one or two examples, every one of them has seen such drastic redesigns and frequent permutations that sometimes they’re just the same character in name only…and sometimes not even that. Ahhhh…I guess writing is just funny that way, huh? It really is. When I make a new version of a character for a new media it’s because I’m attached to the spirit of that character. Part of the fun of making the new version is seeing how the new environs would change them or the differences in them as a person. One of the earliest examples of this was something I wish I would have pursued now, but it was a full cast Medieval versions of the Macro Corp. These shifts make you really question how well you know your characters. Maybe some day soon I’ll show details regarding Mac and the gang. I do miss them terribly, and at the very least it would highlight how much I’ve grown as an artist since then.